Trampoline winter care is an incredibly important and often misunderstood aspect of trampoline ownership that you should make sure you understand all the particulars of. If you leave your trampoline out, you’ll need to take steps to winterize it and maybe find a winter cover for the trampoline. If you bring it in, you’ll want to disassemble and store it properly. 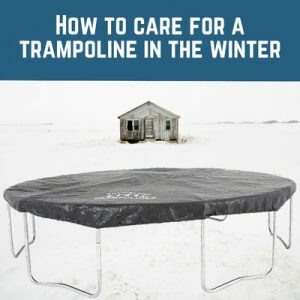 Whatever you choose, this guide should help you understand everything you need to know about how to care for a trampoline in the winter. 1 What is trampoline winter care? 2 Can a trampoline stay out in winter? 4 Should I anchor my trampoline? 5 How do I disassemble a trampoline in winter? 6.1 Do I need a trampoline cover in winter? What is trampoline winter care? Trampoline winter care is simply any action that you take to protect your trampoline during the winter. As we all know, trampolines are expensive and take a long time to install, so you don’t want your investment to be ruined by bad weather! You might need to take the trampoline apart and take pieces of it inside, or you might be able to get away with just purchasing a winter cover for your trampoline and leaving it out. A lot of it depends on where you live and what kind of weather you’re expecting. Can a trampoline stay out in winter? This depends on a few factors. Any good trampoline should be designed with high-quality rust-proof materials, so the wetness won’t be a problem on that front. But if the area where you live gets a lot of heavy snow, it can pile up until it exceeds the maximum weight of the trampoline and break the jumping surface or the springs. As a general rule, we recommend that you at least remove the pads, the jumping surface and the springs during the winter so that you don’t have to worry about snow. If you don’t want to go through the hassle of disassembly, you can also buy a trampoline cover for winter which we will discuss in more detail later, although you shouldn’t do this if you’re expecting more than an inch of snow. In almost all cases, you should be fine if you leave the metal frame and the poles standing in the yard. Of course, if you have an indoor trampoline feel free to bring it inside so that you or your children can keep getting some good exercise even if the weather isn’t cooperating. Winterization is a process that will keep your trampoline clean and safe if you leave it up in the winter. The first step of winterization is removing the frame pads from your trampoline and storing them indoors to keep them from getting soaked by rain or snow, which can damage them. Then you simply have to keep it clean by regularly brushing off any snow with a broom and making sure that your cover (if you have one) isn’t trapping moisture and getting mildewy. NEVER clean your trampoline with a shovel or a snow-blower; ALWAYS use a broom. Even a plastic shovel can tear a hole in your jumping surface, which can make it very dangerous to jump on later. And snow blowers will melt mat fabric and PVC vinyl padding, which will probably require you to replace the trampoline outright. Should I anchor my trampoline? If you have strong winds in the winter, a strong anchor will keep your trampoline from becoming a safety hazard. Some specialized anchor kits include stakes that will attach the frame of the trampoline to the ground, and these are usually a good and relatively inexpensive precaution that we recommend you take to care for a trampoline in the winter. If you don’t want to buy stakes, another option is to dig trenches in the ground before you set up the trampoline for the first time, place the legs of the trampoline in the trenches, and then pack dirt or mulch around the legs so that the trampoline is secured by the ground itself. This option works at least as well as stakes in most cases, but the soil can be weakened by a lot of moisture, and it’s obviously very frustrating to try and do this if the trampoline has already been assembled. How do I disassemble a trampoline in winter? If you’re having a moderate winter, a winter cover like the ones below should be fine. If you expect heavy snow, you’ll want to disassemble the soft frame pads, the jumping surface, the safety netting (if applicable) and the springs. If you’re expecting snow AND heavy wind and you’re worried your trampoline might not be properly staked or buried, you might want to take down the metal poles and frame, but you shouldn’t have a problem leaving them up in most cases. As for how you can disassemble a trampoline as part of your winter care, the specifics will vary slightly depending on the product you own, and you should always consult a manual first to see what it says about disassembly. Clean the surfaces with a damp towel or rag washcloth so that the pads won’t get mildewy or gross in storage. Remove the pad (or pads, depending on the model) around the outside of the trampoline, fold them up, and store them somewhere dry. Remove the safety enclosure if applicable. There are many different types of safety enclosures, so we strongly urge you to consult the manual or contact your trampoline manufacturer for this step. Remove the springs. Most trampolines come with a tool for spring removal that works a bit like a miniature crowbar and is used to pull one end of the spring out from the hooks on the jumping surface.After that, the spring should just pop out in most cases. Some people try to remove springs using the other springs instead of the included tool (and there’s even YouTube videos that recommend this method) but this can cause damage and we would urge you to follow the manufacturer’s’ instructions. Lay the jumping surface flat on the ground and fold it carefully. It should now be ready for storage along with the springs. If you’re taking down the metal frame, unscrew the top screws on each pole and remove the large circular/rectangular/square frame. Pull the frame apart and store the pieces. Pull the poles out of the ground (after unstaking them, if applicable) and store them. Do I need a trampoline cover in winter? Trampoline covers are a good solution for winters where you expect to have low to moderate snow and don’t want to go through the hassle of winter trampoline disassembly. In many cases, they can also be used for rain in other parts of the year, so they’re usually a pretty good investment! Just make sure they’re not locking in moisture, which can lead to mildew and other problems, by checking your cover once a week or so and taking it off to dry if it looks like it’s becoming a problem. This UV-resistant laminated cover is available in two colors and nine different sizes and attaches to the frame using S-hooks. 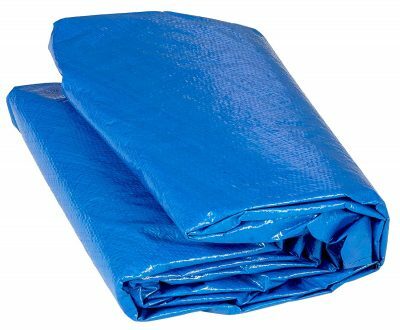 It’s one of the cheapest covers available and works great for wind, rain, and snow. For only $15 extra you can buy it with a set of four trampoline wind stakes, which might be a good option if you’re interested in the best trampoline winter care available. This is one of the only winter covers for trampolines that fits over the trampoline mat AND around the enclosure poles. Velcro straps and buckles fix onto each enclosure upright to make sure that the cover is secure at the place where the poles meet the frame and mat. 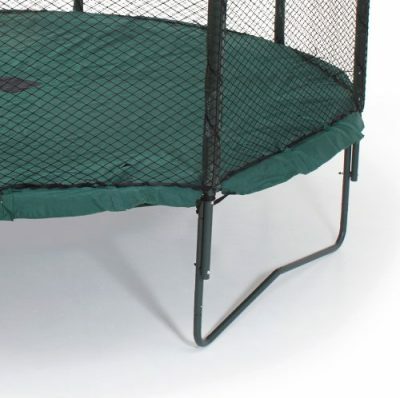 However, this cover is a lot bulkier and heavier than most other options at 17.6 pounds, so it’s really not recommended for areas where the snow could pile over the trampoline’s weight limit. This cover is specifically designed for Skywalker brand trampolines and is made of weatherproof vinyl-coated material just like the Upper Bounce option. It’s a little expensive, but it’s very lightweight (which makes it a good winter option) and it’s kept in place with the tension of a heavy-duty cord wrapped around the trampoline frame, which makes it much easier to assemble than the other two options we’ve recommended today. Hopefully you’ve learned a bit about trampoline care in winter and can now make the best choice when it comes to taking care of your trampoline. Please let us know in the comments if you have a question we didn’t answer – we’ll be keeping this article regularly updated to make sure we have the best trampoline winter care information available.